RUSH: Who is America’s No. 1 most effective gun salesman? Anybody want to take a stab at this? America’s number one, by far, it’s not even close — well, actually it is. America’s number one gun salesman none other than Barack Hussein Obama. But he’s about to be eclipsed by a brand-new most effective gun salesman in the United States. 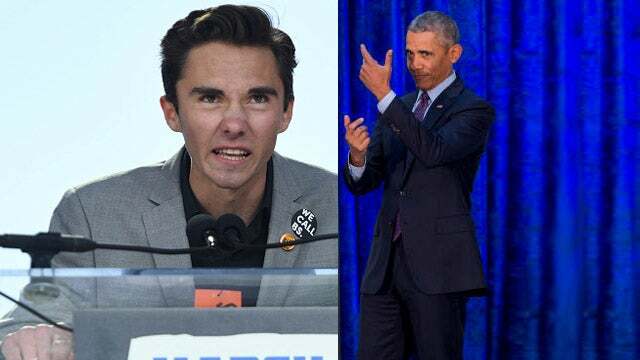 David Camera Hogg is nipping at Obama’s heels for this contest. This guy has caused more people to join the NRA in the shortest amount of time than anybody in American history. David Camera Hogg has been responsible for more people purchasing guns at a rate we haven’t seen in many years, according to NRA statistics. So you have two very skinny, slick talking leftists. And what are they best at? Selling guns. Don’t you love it? I’m not trying to diminish Obama’s assaults on America via his transformation of the country. I get that, but given what they claim they are against, given what they claim they want to stop, these two guys end up being greater salesmen for guns and NRA memberships than Charlton Heston ever was — and Charlton Heston was great! He was a board member. He used to be the face of the NRA. Tom Selleck at times was. But, I mean, nobody can hold a candle to these two guys. Now, Obama had to know it. I don’t know about Camera Hogg. But I know that Obama had to know this. He had to know that every time he railed about guns he was going to increase gun sales like never before, and yet he continued to do it. My guess is he didn’t mind. In Obama’s world, the more law-abiding people with guns, the worse it’s gonna be. The more law-abiding people with guns the greater opportunity we’re gonna have someday to blame one of them and take everybody’s guns away. I don’t know. Their thinking is convoluted in a lot of ways.